a time to get: Oh, Mr. Fiiiiilson. Has anyone ever heard of this new brand, Filson? They seem to make some pretty great stuff. I wonder why nobody has covered it on these blog things. I don't care how "played" these little guys are, you put a pile of beautifully worn ones on display in your shop and I will come. Well, Unionmade, here I come. 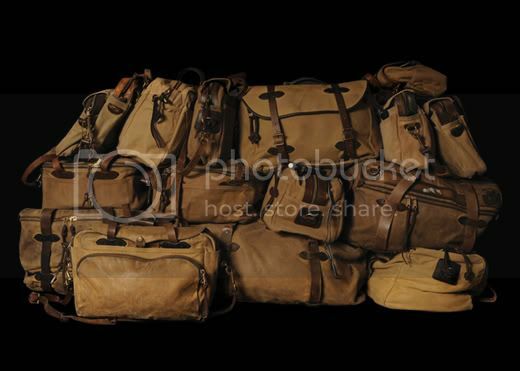 On display, for a limited time, is one of the better collections of lovingly-used and abused bags ever assembled. I heard next month they're going to showcase a collection of Steve McQueens.